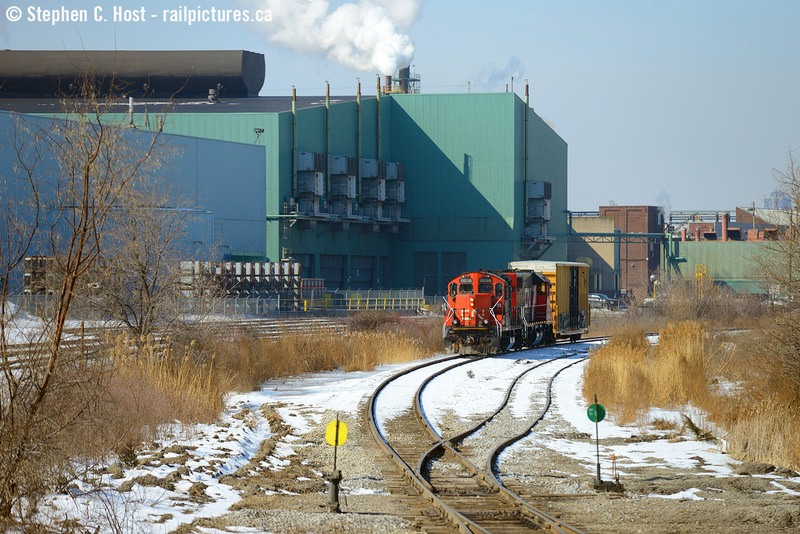 Railpictures.ca - Stephen C. Host Photo: A train rounds the curve on the Kenilworth lead at the far end of the N&NW spur, with a single boxcar it looks rather diminutive to the Dofasco factories behind them. The CN mainline here was likely re-aligned for the Ore Trains along with the Ore Train lead constructed just around the curve of this photo. To the left is the Dofasco yard (track owned and operated by Dofasco). This is what remains of Dofasco track in this part of Hamilton the mainline once stretching from about here all the way down beyond Depew St! Their line is mostly ripped up now and what remains looks rather forlorn except for the track inside Bayfront which is still used 24/7 by bottle trains and coke oven moguls. My first time actually shooting CN down here in the “hole” – I do miss the SOR though. Saturday Morning’s yard job was switching the yard while I ran into rp.ca Moderator Ryan Gaynor. We chatted a bit while shooting the geeps switching the yard, then the geeps ran under us with a single boxcar well past any yard leads — I knew right away they were going down the hole. Box car? Surely for Parkdale Warehousing all the way down the other end of the N&NW spur? Yup, so we got to follow all the way down in quite nice light. Not all jobs are daily, in fact, it seems weekends can be pretty quiet. We ran into James Knott down there also making for a trio of regular Hamilton guys following the action. Great to see y’all. With thanks to Tim Stevens, the Hamilton yard jobs are as follows: YHM013 – 0700. YHM303 – 1500. YHM313 – 1400. YHM603 – 2300. Not all jobs are daily but two sets of power are assigned to the yard at the present time. Weekends seem to be quiet in Hamilton but there is some action. | Railpictures.ca – Canadian Railway Photography – photographie ferroviaire Canadienne. Caption: A train rounds the curve on the Kenilworth lead at the far end of the N&NW spur, with a single boxcar it looks rather diminutive to the Dofasco factories behind them. The CN mainline here was likely re-aligned for the Ore Trains along with the Ore Train lead constructed just around the curve of this photo. To the left is the Dofasco yard (track owned and operated by Dofasco). This is what remains of Dofasco track in this part of Hamilton the mainline once stretching from about here all the way down beyond Depew St! Their line is mostly ripped up now and what remains looks rather forlorn except for the track inside Bayfront which is still used 24/7 by bottle trains and coke oven moguls. My first time actually shooting CN properly down here in the "hole" - I do miss the SOR though. Saturday Morning's yard job was switching the yard while I ran into rp.ca Moderator Ryan Gaynor. We chatted a bit while shooting the geeps switching the yard, then the geeps ran under us with a single boxcar well past any yard leads -- I knew right away they were going down the hole. Box car? Surely for Parkdale Warehousing all the way down the other end of the N&NW spur? Yup, so we got to follow all the way down in quite nice light. Not all jobs are daily, in fact, it seems weekends can be pretty quiet. We ran into James Knott down there also making for a trio of regular Hamilton guys following the action. Great to see y'all. With thanks to Tim Stevens, the Hamilton yard jobs are as follows: YHM013 - 0700. YHM303 - 1500. YHM313 - 1400. YHM603 - 2300. Not all jobs are daily but two sets of power are assigned to the yard at the present time. Weekends seem to be quiet in Hamilton but there is some action. Great info – thanks, guys! Yeah, 142 and 247 better hope they aren’t running late on Sundays I guess. Most excellent. Right now I think this is a definitive list for the Steel City fans. So I guess if a CP train needs a push on a Sunday morning it’s not happening eh. Thank you. Oh – What’s CP’s actual schedule. Do you know? I never bothered to find out. It’s fair to note that both CN and CP were down there at the same time on Saturday. This is awesome. One of my favourite all time Hamilton shots already. So much to enjoy about this. Thanks to you and Tim too, I didn’t realize the jobs had any identifiers beyond the time. Weekends are indeed typically much quieter these days! No 0700 job on Sunday for CP certainly compounds that.